..... かりがね , カリガネ" lesser white-fronted goose、Anser erythropus, flying in "chevron shape"
This refers to the wild geese. The geese come to Japan in autumn and spend the winter here.
. byoogan no yosamu ni ochite tabine kana .
. ganburo 雁風呂 がんぶろ "bath for the wild geese" . The geese are leaving Japan now and go back to Northern regions. They are off to their Northern breeding habitats. is the general English name for a considerable number of birds, belonging to the family Anatidae. This family also includes swans, most of which are larger than geese, and ducks, which are smaller. Goose in its origins is one of the oldest words of the Indo-European languages (Crystal), the modern names deriving from the proto-Indo-European root, ghans, hence Sanskrit hamsa (feminine hamsii), Latin anser, Greek khén etc. In non-technical use, the male goose is called a "gander" (Anglo-Saxon gandra) and the female is the "goose"; young birds before fledging are known as "goslings". A group of geese on the ground is called a gaggle; when flying in formation, it is called a wedge or a skein. Eine sehr bekannte und häufig angewandte Redensart, um die geistige Beschränktheit weiblicher Personen zu bezeichnen. Die Gans steht bei uns ebenso allgemein in dem Rufe der Dummheit wie der Esel. Auch führt sie den Namen Alheit = Adelheit, abgekürzt Alke. Man leitet diesen Namen ebenfalls aus der Dummheit und Geschwätzigkeit her, durch welche die Gans charakterisiert wird. In other cultures, we have other associations with these animals. "The Golden Goose" in Grimms Fairy Tales. Winter migrant from high-Arctic Canada. Most occur in Ireland between October and April. Mostly found on coastal estuaries during the autumn and early winter, and also on grasslands from mid-winter, until departure for the breeding grounds begins in late April. Shiniji Ogawa notes that ato in this haiku, though it is spelled with the kanji for "footprint," in fact means "rear": ato no kari = "rear goose."
. Why Ducks Sleep Standing On One Leg . I feel the parting geese and their honking are the "urusai nenbutsu"
that Issa hears in the fields.
. Namu Amida Butsu, the Amida Prayer . This hokku was written at the end of the 8th month (early October) in 1812. Wild geese have flown south to Japan for the winter, and a group is now in a small dry rice paddy that's mostly empty following the recent rice harvest. As the geese bend over and forage in the grasses and stubble that remain, their tail feathers point up toward the moon. In Issa's time an evening moon (yuuzuki) was usually a waxing moon going down in the west late in the afternoon or in the twilight, so the tails of the geese are pointing upward and westward. Perhaps Issa feels it's uncanny that the tails of the geese are pointing in the direction of the Pure Land even though they don't seem to be aware of it. This autumn hokku was written in the 7th month (August) in 1810, when Issa was traveling around in the area to the east of Edo. The gate does not belong to a typical farmhouse, and this is no ordinary rice paddy. Most paddies were located some distance from the farmer's house, but this paddy is located directly in front of the large front gate of a temple or shrine or the gate of a mansion owned by a rich landlord or samurai, and it is choice land, probably with high yields. 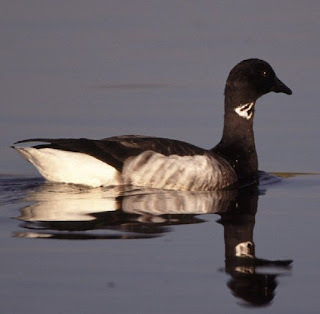 Wild geese usually return to the Edo-Tokyo area in October and stay until spring, but Issa is writing in August, so this seems to be a hokku based on a memory. In October the paddies have been drained and harvested, and the wild geese go through the now dry fields looking for straw and stray grains of rice. They have been enjoying themselves and making quite a racket in the dark, but when the moon rises they realize they can be seen, and they suddenly become more polite, presumably quieter and less conspicuous. Issa seems amused, and the geese apparently remind him of humans who suddenly become restrained and polite when they visit a temple or pass by the mansion of a powerful person. This hokku was written in the 9th month (October) of 1819, the year Issa recorded in Year of My Life (Oraga haru). Looking up, Issa sees another line of wild geese flying south for the winter. Since wild geese fly south to Japan in order to winter in warm places, they tend to fly right over Issa's hometown or stay there only for a short time, since it's on a high plateau that's very cold and snowy in the winter. To get their attention, Issa addresses them strongly. It's almost as if he's shouting up at the birds in the sky as they pass over him. Don't look anywhere else -- look straight ahead and land right here in front of me as quickly as you can. Do the birds feel the depth of his desire to meet them? This spring hokku was written on 1/21 (March 2) of 1804, when Issa was living on the outskirts of the city of Edo. All winter wild geese from Siberia have been foraging the dry, stubble-filled rice paddies in this farm village near Edo. Even though the area gets a bit of snow in the winter, the geese find enough food to stay alive. However, the local farmers have today turned their rice fields into shallow ponds so they can begin to prepare them for rice planting in late May or early June, and suddenly the geese have lost their main places to forage and their favorite places for hanging out. They seem to get the message and set out the same day for their northern summer home. Because there is a cutting word at the end of the first line, no viewers are explicitly connected to the verb in the second line. This is normal procedure in Japanese poetry, in which syllable space is limited and suggestion is a main means of reference. Usually this simply indicates that the author feels there are enough details in the waka or hokku to allow the reader to infer who is doing what. In Issa's hokku, "weren't visible" implies that yesterday neither humans nor birds could see any wet paddies in the area, but today they all can see them. Since the first line makes the returning geese the focus of the hokku, however, the most important eyes are those of the birds. It's the geese who are shocked to see their temporary winter foraging grounds now covered by water, and it's the same geese who leave (yuku) for the north the very same day. The two verbs are linked: it's what the geese see that makes them head back north. To the villagers and to Issa, the now wet fields are a normal change and not a special sight. Still, to Issa the sudden departure of the flock of geese is no doubt a moving experience, and in the previous hokku in his diary he wistfully says that it has at last become time for the wild geese to return north and leave the area outside his door. This hokku was written in the 2nd month (March) of 1810, when Issa was traveling around visiting students in the area east of the city of Edo. It seems to be a humorous hokku using personification and tinged with longing. The wild geese are all leaving Japan now and flying back to their summer homes in the north, and not one stops to say goodbye to Issa. Writing of the geese as if they were his friends, Issa asks them a question with an ending, ya wa, that is usually ironic, and refers to himself as useless, a failure, and a good-for-nothing even though he is able to at least survive by teaching haikai and has gained enough confidence in his own haikai to begin his Seventh Dairy at New Year's in 1810. It seems likely that Issa's strongest sense of failure at this time was his continuing inability to move into his half of his natal house in his hometown. After negotiating hard, he finally signed an agreement with his half brother in 1808 to split half his father's property, but in reality his brother and stepmother continued to refuse him entrance to his half of his father's house. Yet Issa was trying to do something about it. About three months after this hokku was written, Issa made still another trip to his hometown, so he was probably planning the trip at the time the hokku was written. With irony Issa seems to playfully scold the returning geese for giving up on him too soon and leaving him behind, since he is planning to return to his hometown again and again until he, too, can truly call it home. This hokku is from lunar 11/17 (Dec. 30) in 1803, when Issa was visiting Fukawa, a river town northeast of Edo, just beyond the northern border of the wide Katsushika District in Shimōsa Province. Perhaps some wild geese wintering in Fukawa reminded Issa of what he felt when geese were leaving Japan for the north country the previous spring. 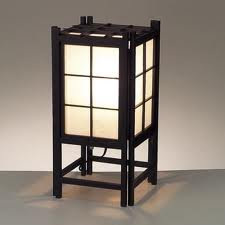 The lamp in the second line or measure of the hokku is one that has a wooden base with a square or round frame extending up above it covered with translucent Japanese washi paper that keeps wind from blowing out the flame. Often such lamps had a handle at the top for portability. Since this is a night hokku, the lamp may be placed just inside the front door of a house. Or is it perhaps in an inn? The lamp might possibly be placed just outside the door if there is a gathering of people there. The verb in the second line, kasumite, also means 'to mist,' but in this hokku it seems more likely to mean 'be dim, faint,' a meaning that was more common in Issa's time than it is in contemporary Japanese. The hokku following this one in Issa's diary is a variant of the present hokku, and it has the light of a lamp in a stable growing dim as geese pass by outside, and the hokku preceding this one has people eating in a room lit by lamplight while geese leave on their journey to the north. Doors, stables, and eating could suggest either people returning after a long day outside or people getting up very early and getting ready for a day's work, or for continuing on a journey. In either case, it was common to get up well before dawn in order to be able to make use of every possible hour of daylight. Since this is a spring verse, I take it to suggest a predawn time when people are getting up and beginning to think about the coming day. Outside a flock of wild geese has been excited by the moon or by the first light of dawn, and it passes by noisily above the house. The light in the lamp is dim now, but no one refills it with lamp oil since dawn is not far off. Perhaps people are going out the door and getting ready for work or for a trip as the geese fly over, and the gradually dimming light of the lamp makes the disappearing voices of the geese feel all the more poignant as they begin their their long journey that will take them to their summer homes far to the north. Synesthetically, lamplight here manages to suggest the passage of time, and the gradual disappearance of the lamplight emotionally overlaps with departure of the geese and the growing feeling of loneliness in the humans who hear the geese go by, leaving them behind.
. - ANDON 行灯 Andon lanterns of old - . (The correct reading is ichigyoo for animals. 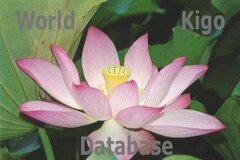 ikkoo is for human beings. The moon is put for seal. - snip - Buson is likening a passing line of wild geese on a moonlit autumn night to a vertical scroll on which there is a line of black writing, and he is likening the bright autumn moon above the foothills to the reddish-orange round seal mark of the painter. He thus pulls the mind of the reader in two directions — one a real scene, the other the work of a calligrapher-painter. Hokku, in my view, should not do this. It leads, as I have said, not only to artificiality, but it also does not allow a thing to simply be what it is, to stand on its own merit and power. in this cold water . . . Written for priest Genki 元起, who had given him some rice wine as a present. Basho age 43. The cut marker KANA is at the end of line 3.
. anagachi ni u to seriawanu kamome kana . As with the migrant birds, so surely with us, there is a voice within, if only we would listen to it, that tells us so certainly when to go forth into the unknown. Read the comments by Chris! Written in autumn of 1690 元禄3年秋. It is not clear weather this is a hokku by Basho himself.
. Takahashi Dosui 高橋怒誰 . This hokku is from the first month (February) of 1810, when Issa was living in and around the city of Edo, though he hoped to return to his hometown soon. In fact, in the fifth month of 1810 Issa went back to his hometown and tried to negotiate with his brother about their father's house, but his brother completely refused to discuss the issue, so when Issa wrote this hokku, he already must have been thinking about making the trip home. He seems to be very happy for the wild geese, almost to the point of envy, since they have their own home in the north to return to when spring comes. The geese faithfully return home year after year, but today Issa seems to have gotten up very early, while the geese are apparently still sleeping. Snowfall in the Edo/Tokyo area wasn't and isn't nearly as heavy as in Issa's hometown, and in February many of the plum trees in Edo must already have been blooming. Issa asks the geese to realize how lucky they are and urges them to make the best of the warm weather and fly home. This hokku is from the ninth month (October) of 1811, when Issa was in Edo and the area just to the east of Edo. The goose has only recently flown south to Japan for the winter, so it's interesting to imagine what it might have seen with its wild Siberian eyes when it looked inside the house where Issa was staying. Presumably Issa's eyes and the goose's eyes meet, and perhaps for a moment the doorway is more than a utilitarian space. For the readings in the first hokku I follow Maruyama Kazuhiko, Issa's Seventh Diary 1.194. This hokku is from the second month (March) of 1816, when most of the wild geese that have wintered in Japan fly back north to Siberia. Issa's hometown was not located in a warm area where wild geese wintered when they came south to Japan in late fall, so this goose couple must have stopped briefly in the mountainous area near Issa's hometown on their way back north in spring. They seem to Issa to be having a very serious conjugal conversation as they prepare to leave, talking back and forth as if, perhaps, they were discussing the merits of staying longer versus continuing to fly north even while they are taking off. Finally, like any other married couple, they do manage to make up their minds, though they continue to cry loudly they disappear into the northern sky. Issa uses an old Japanese word for a married couple that puts the wife (me) first and the husband (oto) second. Later Japanese words for a married couple such as fuufu usually, in good Confucian fashion, put the husband first and wife second.